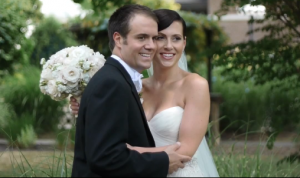 We have a simple way for you to select the type of wedding day film coverage that you desire. What’s important to you? The getting ready moments before the wedding? The post wedding pictures at a park or the church before you arrive at the reception location? Perhaps you want just the ceremony and reception with a highlight music montage video. The options are all possible because it’s your special day and we want to capture what is most important to you. For corporate media production see our “Corporate” rate page. Our wedding film prices range from $800-$4000. You can easily pick and chose what type of wedding day coverage you want by combining any of these options together creating the perfect wedding day film for you and your family. Call today for our wedding film prices on the following options. Special “Love Story” music montage that deeply shows the love you have for each other in a very artistic documentary interview style approach all recorded during the pre wedding time. All of the above options will be mastered to .mov files and placed on an SD card for you to watch on your computers and/or personal media. If the weather is good I always have my Drone on hand for free to capture some of the most beautiful footage from above. In order to retain our services we need a $250 retainer payment and then another $250 by the time of the wedding date. The remainder can be paid after the wedding. We do accept Credit Cards.